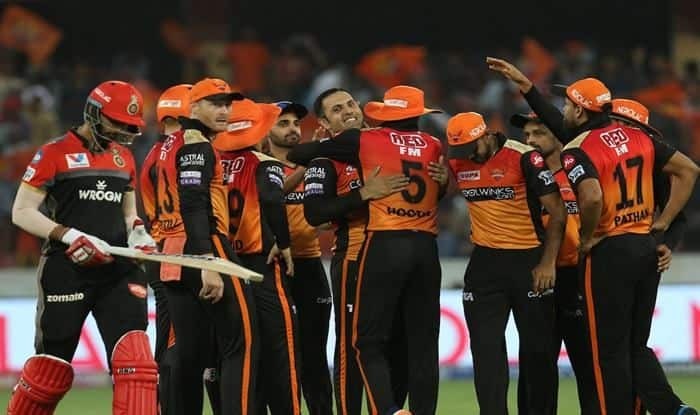 IPL 2019 Latest Updates Match 11: Bairstow and Warner struck whirlwind centuries as Sunrisers Hyderabad (SRH) cantered to a 118-run victory over Royal Challengers Bangalore (RCB) on Sunday. 19.25 IST: An appeal for run out has been taken upstairs. Colin de Grandhomme is the man in question here. Even if he is in. Mohammed Siraj has to walk back as there was run out at the other end as well and Siraj was way short there. 18.58 IST: FOUR! Some runs coming here for Bangalore as the 50-run stand comes up. Kaul bowls it short this time, Ray Barman pulls it and sends it one bounce into the fence at backward square leg. 18.35 IST: Strategic break – 40/6 at the end of 9 overs. This has gone from bad to worse to worst for Bangalore. Mohammad Nabi has completed his 4 over spell and picked up 4 wickets himself and Hyderabad seem to be coasting to a huge win here. Bangalore can’t do anything but try to forget this day. They need to look and bat as long as possible for their net run rate. Meanwhile, Rashid Khan to bowl after the break. 18.33 IST: SIX! The fifty comes up! Not for de Grandhomme but for the team. A length ball on middle, Colin stands tall and pulls this over deep square leg for a maximum. Great shot though Bangalore will need a lot more of these. 17.59 IST: FOUR! Shot! That sounded really good off the bat. Nabi drags this down slightly and Patel pulls it over mid-wicket for a meaty boundary. 17.53 IST: We are back for the chase. The two batsmen out in the middle for Bangalore are Parthiv Patel and suprise, Shimron Hetmyer. The opening bowler for Hyderabad will be Bhuvneshwar Kumar. 232 to win! It is surely going to be fun, if Bangalore are to get anywhere close to this total. Let’s play!!! 17.35 IST: SIX! HAMMERED! Bowls a length ball on the pads, Warner picks it and sends it sailing over backward square leg for a maximum. He has shifted gears after Bairstow left and has taken the onus on himself. 17.33 IST: FOUR! PERFECT PLACEMENT! That’s a shot with perfect timing on it. Yadav bowls a full toss outside leg, Warner moves away and places it through the gap at covers for a boundary. 17.23 IST: SIX! 200 up for Hyderabad. It is in the slot for Warner, he moves his leg and slams it over the long off fence for a maximum. 17.15 IST: Strategic Break – This has been a hammering of sorts so far! There has been no respite from either opener and Jonny Bairstow has even gone on to make a century. With 4 overs remaining, Bangalore will hope to restrict the runs to as low as possible while Hyderabad will love this total to swell over 240. Let’s see how it pans out! Meanwhile, Yuzvendra Chahal to bowl after the break. 17.10 IST: SIX! Continues the big-hitting! Quicker leg spinner on middle, Bairstow dances down the track and lofts it flat over long on for a maximum. Sixth maximum for him. 16.48 IST: SIX! Don’t even bother looking that one is out of here. Floated on off, Bairstow smacks this over covers for a maximum. 16.51 IST: FOUR! Boundary to begin with. Yadav starts with a short ball on leg, Bairstow clears his left leg and pulls it behind square leg for a boundary. 16.41 IST: Strategic Break – Well, well, well! Hyderabad are off to a flyer. Bairstow and Warner are going hammer and tongs after the Bangalore bowling. End of the Powerplay and they are 59/0. The hosts will hope these two can continue the onslaught. Bangalore need to get wickets and stop the free flowing runs here. 16:45 IST: Amazing shot! Short of a length delivery, Bairstow pulls it over mid-wicket for a maximum. Jonny is on fire here. Consecutive sixes here for him. 16:30 IST: FOUR, Fifty comes up for SRH! Bairstow smokes this through point and gets a boundary. Flying start for Hyderabad. 50 up in the fifth over with that boundary. 16:17 IST: The SRH are now at 43/0 with 4 overs gone. 16:16 IST: Mohammed Siraj is going to bowl the fourth over. SRH will hope he does not repeat his 3/25 performance – the best bowling performance in the history of this tie. 16:11 IST: Warner and Bairstow both look like they are in the mood this evening, quick running, converting their singles into doubles. 16:08 IST: The hosts are off to a great start, SRH are 21 after two overs. 15:41 IST: Prayas Ray Barman one of the youngest players in a T20 at 16 years 157 days, he makes his debut for RCB. 15: 36 IST: Here’s the team news from Sunrisers Hyderabad. 3:31 IST: It is Virat Kohli calls heads and he wins the toss for Bangalore, they will bowl first. 3:22 IST: The hosts have an edge over their counterparts at this venue with a record of five wins in six matches so far. 3:15 IST: Stay tuned, toss will take place in 15 minutes time. Preview: Having registered their first win of the season on Friday night, Sunrisers Hyderabad will be high on confidence when they take on Virat Kohli’s Royals Challengers Bangalore in Sunday’s afternoon game at the Rajiv Gandhi International Stadium. The RCB are yet to register a win after two games and the boys will look to turn things around in Hyderabad. But it won’t be very easy because firstly SRH will have the home support and secondly with the sun beating down on the wicket, it could be that spin comes into play and makes stroke-making difficult. Like David Warner pointed out after Friday’s match that it wasn’t the easiest of wickets to bat on and Sanju Samson’s hundred showed how good a batsman he is. Though he was also quick to point out how things could be different on Sunday as it will be a 4 p.m. start. While SRH look like a side which has a sorted line-up, RCB will need to relook the batting. They have failed to do well in both their games. While the 70 all-out in the first game was more due to the pitch conditions at the Chepauk Stadium, their failure to chase down Mumbai Indians’ total of 187 at home on Thursday raised the question on whether the unit was too dependent on skipper Kohli. Although AB de Villiers did score a brilliant 41-ball 70, there was not much support for him after Jasprit Bumrah dismissed Kohli for a 32-ball 46. The other batsmen too need to chip in and contribute to ensure there is enough balance. This is something that SRH has been brilliant with, as was evident again on Friday. If Warner and Jonny Bairstow gave the team a brilliant start at the top by putting on 110, all-rounder Vijay Shankar hit a calm 35 off 15 balls to show how he has matured in the last 12 months as a cricketer. And when the going got tough in the end, Rashid Khan hit a four and a six off successive balls to take SRH home against Rajasthan Royals. T20 cricket is mostly about the batsmen and RCB must get their batters to fire if they wish to register their first win of the season on Sunday.